Arms control aims at preventing conflicts and fostering stability in inter-state relations by either reducing the probability of usage of a specific weapon or regulating its use and thus, reducing the costs of armament. Several approaches to arms control exist: limiting or reducing numbers of weapons and armed forces, disarmament (“down to zero”) or prohibiting certain weapons. To illustrate these further, this chapter elaborates on the necessity of arms control and presents some historical examples, including an overview of existing measures of arms control. Extrapolating from these, the general architecture of arms control regimes and the complex issue of establishing and verifying compliance with agreements will be discussed, not least with respect to cyberspace. Building on these theoretical considerations, the chapter presents important treaties and first approaches, including the Wassenaar Arrangement, the recommendations of the OSCE, and the UN GGE 2015. Meyer, P. (2011). Cyber security through arms control - An approach to international cooperation. The RUSI Journal, 156 (2), 22-27. https://doi.org/10.1080/03071847.2011.576471. UNIDIR. (2013). The Cyber Index - International Security Trends and Realities. Retrieved January 23, 2019, from http://www.unidir.org/files/publications/pdfs/cyber-index-2013-en-463.pdf. ABM. (1972). Treaty Between the United States of America and Union of Soviet Socialist Republics on the Limitation of Anti-Ballistic Missile Systems. Retrieved January 23, 2019, from https://www.treaties.un.org/doc/Publication/UNTS/Volume%20944/volume-944-I-13446-English.pdf. BWC. (1972). Convention on the Prohibition of the Development, Production and Stockpiling of Bacteriological (Biological) and Toxin Weapons and on their Destruction (Btwc). Retrieved January 23, 2019, from https://www.unog.ch/80256EDD006B8954/(httpAssets)/C4048678A93B6934C1257188004848D0/$file/BWC-text-English.pdf. CCM. (2008). The Convention on Cluster Munitions (CCM). Retrieved January 23, 2019, from https://www.unog.ch/80256EE600585943/(http-Pages)/F27A2B84309E0C5AC12574F70036F176?OpenDocument. CFE. (1990). Treaty on Conventional Armed Forces in Europe (CFE). Retrieved January 23, 2019, from, https://www.osce.org/library/14087?download=true. Commonwealth, T. (2018). Commonwealth Cyber Declaration. Retrieved January 23, 2019, from https://www.chogm2018.org.uk/sites/default/files/Commonwealth%20Cyber%20Declaration%20pdf.pdf. CSCE. (1986). Document of the Stockholm Conference on Confidence- and Security-Building Measures and Disarmament in Europe Convened in Accordance with the Relevant Provisions of the Concluding Document of the Madrid Meeting of the Conference on Security and Co-Operation, (2). Retrieved January 23, 2019, from https://www.osce.org/fsc/41238?download=true. CWC. (1997). Convention on the Prohibition of the Development, Production, Stockpiling and Use of Chemical Weapons and on their Destruction (CWC). Retrieved January 23, 2019, from https://www.opcw.org/chemical-weapons-convention. Davis II, J. S., Boudreaux, B., Welburn, J. W., Aguirre, J., Ogletree, C., McGovern, G., & Chase, M. S. (2017). Stateless Attribution: Toward International Accountability in Cyberspace. RAND. Retrieved January 23, 2019, from http://www.rand.org/pubs/research_reports/RR2081.html. Den Dekker, G. (2004). The Effectiveness of International Supervision in Arms Control Law. Journal of Conflict and Security Law, 9 (3), 315-330. https://doi.org/10.1093/jcsl/9.3.315. EU Commission. (2016a). Commission Proposes to Modernise and Strengthen Controls on Exports of Dual-Use Items. Retrieved January 23, 2019, from http://trade.ec.europa.eu/doclib/press/index.cfm?id=1548. EU Commission. (2016b). Regulation Setting up a Union Regime for the Control of Exports, Transfer, Brokering, Technical Assistance and Transit of Dual-Use Items (Recast). Retrieved January 23, 2019, from http://trade.ec.europa.eu/doclib/docs/2016/september/tradoc_154976.pdf. EU Parliament. (2018). Adopted text: Control of Exports, Transfer, Brokering, Technical Assistance and Transit of Dual-Use Item. https://doi.org/10.1080/00344897208656356. France-Gov. (2018). Paris Call for Trust and Security in Cyberspace. Retrieved January 23, 2019, from https://www.gouvernement.fr/en/cybersecurity-paris-call-for-trust-and-security. Goldblat, Jozeph (2002). Arms Control: The New Guide to Negotiations and Agreements. Thousand Oaks, CA: Sage Publications Ltd. http://dx.doi.org/10.4135/9781446214947. Hague Conference. (1899). Convention (II) with Respect to the Laws and Customs of War on Land and its Annex: Regulations Concerning the Laws and Customs of War on Land. The Hague, 29 July 1899 (adopted 29 July 1899, entered into force 4 September 1900) (Hague Convention 1899). Retrieved January 23, 2019, from http://www.opbw.org/int_inst/sec_docs/1899HC-TEXT.pdf. Hague Conference. (1907). Convention with Respect to the Laws and Customs of War on Land. Retrieved January 23, 2019, from https://ihl-databases.icrc.org/ihl/INTRO/195. IAEA. (2015). Joint Comprehensive Plan of Action. Vienna. Retrieved January 23, 2019, from http://eeas.europa.eu/archives/docs/statements-eeas/docs/iran_agreement/iran_joint-comprehensiveplan-of-action_en.pdf. ICRC. (1949). The Geneva Conventions of 12 August 1949. Retrieved January 23, 2019, from https://www.icrc.org/en/doc/assets/files/publications/icrc-002-0173.pdf. INF. (1988). Treaty Between The United States Of America And The Union Of Soviet Socialist Republics On The Elimination Of Their Intermediate-Range And Shorter-Range Missiles (INF Treaty). Retrieved January 23, 2019, from https://www.state.gov/t/avc/trty/102360.htm#text. Mele, S. (2013). Cyber-weapons: legal and strategic aspects. Italian Institute of Strategic Studies “Niccolò Machiavelli.” Retrieved January 23, 2019, from https://www.files.ethz.ch/isn/168388/cf4eaaaf89e17df399d1d580beade36a.pdf. Mölling, C., & Neuneck, G. (2001). Rahmenprojekt: Methoden, Kriterien und Konzepte für präventive Rüstungskontrolle. In: Altmann, J., Bielefeld, T., Dando, M. R., Hotz, M., Liebert, W., Mölling, C., Neuneck, G., Nixdorff, K., Pistner, C. & Schilling, D. Präventive Rüstungskontrolle. Wissenschaft und Frieden (Dossier 38). Retrieved January 23, 2019, from https://www.wissenschaft-und-frieden.de/seite.php?dossierID=008. New START. (2010). Treaty Between the United States of America and the Russian Federation on Measures for the Further Reduction and Limitation of Strategic Offensive Arms. Retrieved January 23, 2019, from http://www.state.gov/documents/organization/140035.pdf. NPT. (1970). Treaty on the Non-Proliferation of Nuclear Weapons. Retrieved January 23, 2019, from https://www.iaea.org/sites/default/files/publications/documents/infcircs/1970/infcirc140.pdf. OSCE. (2011). Vienna Document. Retrieved January 23, 2019, from https://www.osce.org/fsc/86597?download=true#page=1&zoom=auto,-276,842. OSCE. (2013). Initial Set of OSCE Confidence-Building Measures to Reduce the Risks of Conflict Ttemming from the Use of Information and Communication Technologies, (December), 4. Retrieved January 23, 2019, from http://www.osce.org/pc/109168?download=true. OSCE. (2016). Decision No. 1202 OSCE Confidence-Building Measures to Reduce the Risks of Conflict Stemming from rhe Use of Information and Communication Technologies, (March). Retrieved January 23, 2019, from https://www.osce.org/pc/227281?download=true. PTBT. (1963). Treaty Banning Nuclear Weapon Tests in the Atmosphere, in Outer Space and Under Water (Partial Test Ban Treaty ─ Ptbt). Retrieved January 23, 2019, from https://trea-tiesun.org/doc/Publication/UNTS/Volume%20480/volume-480-I-6964-English.pdf..
Sommer, P., & Brown, I. (2010). OECD Study - Reducing Systemic Cybersecurity Risk. Retrieved January 23, 2019, from http://www.oecd.org/governance/risk/46889922.pdf. UN-GGE. (2015). Consensus Report 2015 - Group of Governmental Experts on Developments in the Field of Information and Telecommunications in the Context of International Security - A/70/174. Retrieved January 23, 2019, from http://undocs.org/A/70/174. UN. (1967). Treaty on Principles Governing the Activities of States in the Exploration and Use of Outer Space, Including the Moon and Other Celestial Bodies. Retrieved January 23, 2019, http://www.unoosa.org/pdf/publications/STSPACE11E.pdf. UN. (1999). A/Res/53/70 Developments in the Field of Information and Telecommunications in the Context of International Security. Retrieved January 23, 2019, from https://ccdcoe.org/sites/default/files/documents/UN-981204-ITIS.pdf. UN. (2003). Resolution adopted by the General Assembly on 8 December 2003 on Developments in the field of information and telecommunications in the context of international security. Retrieved January 23, 2019, from https://ccdcoe.org/sites/default/files/documents/UN-031208-ITIS_0.pdf. UN. (2011). Proposal of a Convention for International Information Security by Russia, China et al. Retrieved January 23, 2019, from http://archive.mid.ru//bdomp/ns-osndoc.nsf/1e5f0de28fe77fdcc32575d900298676/7b17ead7244e2064c3257925003bcbcc!OpenDocument. UN. (2013). Arms Trade Treaty. Retrieved January 23, 2019, from https://treaties.un.org/Pages/ViewDetails.aspx?src=IND&mtdsg_no=XXVI-8&chapter=26&clang=_en. UN. (2018a). Draft Resolution by Russia and Other States Concerning the Developments in the Field of Information and Telecommunications in the Context of International Security. Retrieved January, 2019, from http://undocs.org/A/C.1/73/L.27. UN. (2018b). 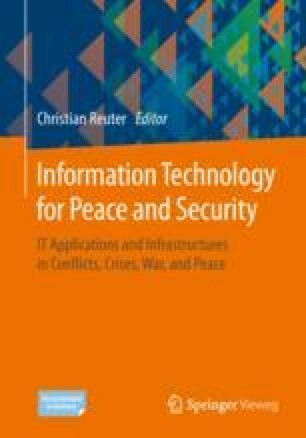 Advancing Responsible State Behaviour in Cyberspace in the Context of International Security (A/C.1/73/L.37). Retrieved January 23, 2019, from http://undocs.org/A/C.1/73/L.37. UN Office for Disarmament Affairs (2017). Voluntary, Non-Binding Norms for Responsible State Behaviour in the Use of Information and Communications Technology: A Commentary. Retrieved January 23, 2019, from https://www.un.org/disarmament/wp-content/uploads/2018/04/Civil-Society-2017.pdf. US Department of State. (1992). Treaty on Open Skies. Retrieved January 23, 2019, from https://www.state.gov/t/avc/cca/os/106812.htm. US Government. (2012). Presidential Policy Directive 20. Retrieved January 23, 2019, from https://www.fas.org/irp/offdocs/ppd/ppd-20.pdf. Wassenaar. (2011). Wassenaar Arrangement on Export Controls for Conventional Arms and Dual-Use Goods and Technologies - Guidelines & Procedures. Retrieved January 23, 2019, from http://www.wassenaar.org/guidelines/docs/5-InitialElements.pdf. Wassenaar. (2013). The Wassenaar Arrangement on Export Controls for Conventional Arms and Dual-Use Goods and Technologies - List of Dual-Use Goods and Technologies and Munitions List. Retrieved January 23, 2019, from http://www.wassenaar.org/controllists/2013/WA-LIST%2813%291/WA-LIST%2813%291.pdf. Woolf, A.F. (2011). Monitoring and Verification in Arms Control. CRS Report for Congress. Retrieved January 23, 2019, from https://www.nti.org/media/pdfs/Monitoring_and_Verification_in_Arms_Control.pdf.